Opening preparation takes up a huge chunk of our time. Not only you need to find the resources to trust, decide on the lines to study, pick the variations to play... You also invest time studying, playing practice games and keeping up with all the theory updates. What does it take to play 1.d4 on the club level and beyond? On top of that, you should be familiar with the London System, Pillsbury attack, Queen's Gambit Declined and Accepted. And if you really want to be prepared don't forget to review the rare lines and deviations! That's a dozen books, months of preparation and a TON of trial and error, leading to MANY lost games and missed opportunities. Sounds like a full-time job, doesn't it? Wouldn’t it be great to spend just a few hours getting all the opening knowledge you need for the years to come? Wouldn’t that make you a much more prepared, versatile and an overall better chess player? What if there was a way to acquire this opening knowledge in a fraction of the time, in a perfectly organized and easy-to-follow manner? What if it came with all the game plans, Grandmaster's ideas, attacking patterns and blueprints? What if you could start applying this GM knowledge immediately, and most importantly start seeing the RESULTS? That's exactly what Opening Mastery - Dominate with 1.d4 is about! This is the ultimate shortcut for club players to get a pro-grade opening preparation after 1.d4. What it'll do for you? Instead of losing TONs of games just to learn what works and what doesn't, you will be given the systems that are proven to work against competition of any level! You will know exactly how to play against and beat players in the 10 most widely played openings after 1.d4: London System, Queen's Gambit Accepted, Queen's Gambit Declined, Slav Defense, Benoni Defense, Kings Indian Defense, Nimzo Indian Defense, Grunfeld Defense, Dutch Defense, Tarrasch and Chigorin Defense! 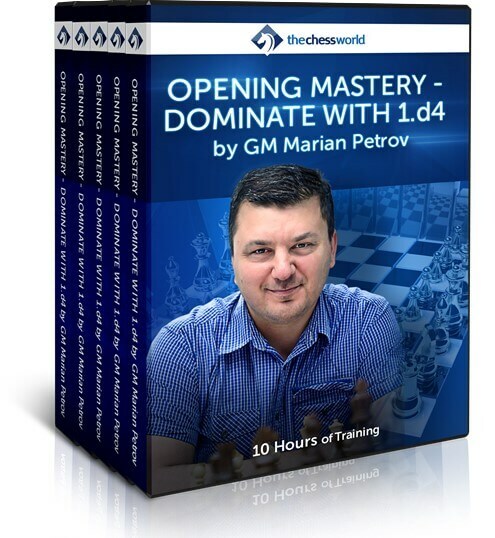 Not only you will gain a very powerful opening repertoire after 1.d4, but also you will learn the most effective attacking plans, pawn structure nuances, correct piece placement, typical maneuvers, and the game-winning strategies. You'll get all the tools you need to unleash your best play under pressure in actual games! In this 10.5-hour course, FIDE Trainer and Olympiad Coach GM Marian Petrov cover almost all possible lines that white could encounter after the most popular 1.d4. It is developed with practical chess players in mind! Train the important tactical skills and motifs with a set of specifically designed tasks and challenges. Practical part is an important element of the course. Downloadable, complete set of PGNs of games covered in the course that you can analyze it at your own pace and convenience. A must have treasure chest for any serious player. Advanced training tasks taken directly from the video course's games. Learn from the ideas and strategies of players like Capablanca, Kasparov and Karpov. After solving those problems you will get one step closer to chess mastery! Work through carefully selected and fully annotated chess studies to take your game understnading to the new heights. Highly recommended for ambitious chess players! This course teaches you want to do when you're outside the opening theory, how to find best moves, construct winning plans, and quickly evaluate the situation on the board. This all requires special thinking is this course is here to help you obtain it in no time! A great complimentary info for the 1.d4 Mastery! Just the video - but still great! is an accomplished professional chess coach, theorist, and Bulgarian champion for 2002 and 2017, as well as winner of many open tournaments around the world. Also a FIDE trainer and coach of the team of Wales at the last Olympiad in Baku in 2016. He graduated from the National Sports Academy in Sofia, Bulgaria with a Bachelor's degree in Chess Pedagogy, a four-year undergraduate program designed to prepare top-level chess trainers.